It is certainly nothing new for a nation to achieve athletic glory on the backs of the same people it oppresses and discriminates against on a daily basis. For the most egregious example, look no further than the hundreds (thousands?) of Olympic medals that Black athletes have won for the United States in the Summer and Winter Games. In the 2018 World Cup, it did not go unnoticed that France’s national soccer team consisted of primarily of immigrants or the descendants of immigrants — many of them from Africa and many of them Muslim. And as it seemed the entire country celebrated following France’s 4-2 victory over Croatia in the World Cup final on Sunday, social media platforms and professional media outlets lit up calling out the irony and hypocrisy. A nation that treats immigrants and Muslims like suspects and outsiders happily took ownership of the accomplishments those immigrants and Muslims completed in the name of France. Paul Pogba, a 25-year-old midfielder who plays professionally for Manchester United in England’s Premier League, is widely recognized as the best overall player on France’s national team and one of the top talents on the planet. N’Golo Kante, a 27-year-old midfielder who plays for Chelsea in the Premier League, is also considered one of the best players in the world. Both international stars are French nationals of African descent who are practicing Muslims, and both were instrumental starters in the World Cup triumph. Reserve forward Ousmane Dembele, forward Nabil Fekir, defender Benjamin Mendy, defender Adil Rami and defender Djibril Sidibe are the other Muslim players on the French team. The rest of the 2018 World Cup field featured dozens of Muslim players and a handful of teams from Muslim-majority countries. Egypt, Iran, Morocco, Saudi Arabia, Senegal and Tunisia were all eliminated in the group stage. Essam El Hadary, a 45-year-old goalkeeper for Egypt, made history when he became the oldest player to start in a World Cup match. Eden Hazard, a forward for Belgium, won the World Cup’s Silver Ball award. The Golden Ball is given to the tournament’s best player. Hazard helped Belgium advance to the semifinals, where they lost to France. 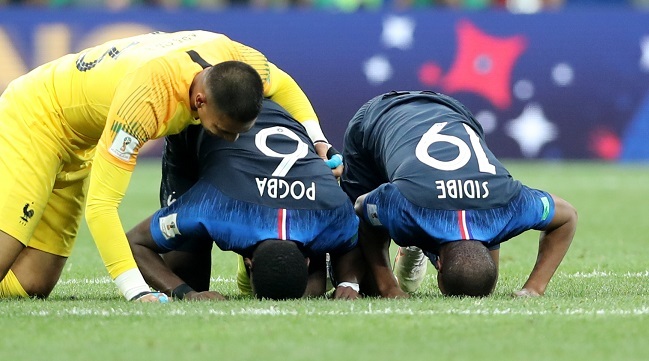 France’s Paul Pogba (#6) and Djibril Sidibe (#19) perform the Islamic prostration sujood after winning the 2018 World Cup.